Unique design for relief of pressure on the coccyx bone. 100% foam construction with 6" opening at the back of the cushion for total comfort. Comes with removable, washable polyester/cotton cover. Navy. 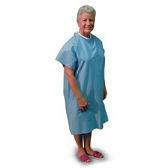 Duro-Med Convalescent Gowns are comfortable with large raglan sleeves and are available in many colors and print designs. 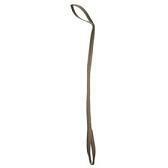 They feature an easy on/off with choice of two back ties, two front side ties, snaps or hook and loop closures. The gowns are made of a machine washable, polyester/cotton. One size fits most adults. The Duro-Med leg lifter has a large loop at both ends to grasp and lift the leg or cast. The 32" aluminum rod shaft is covered with 1" webbing. 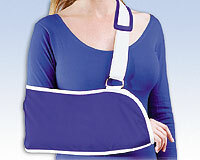 Traditional envelope arm sling comfortably distributes the weight of the arm following surgical or non-surgical treatment of the arm, hand or shoulder. Made in a strong, seamless quality design. Fast and simple application with slide buckle adjustment. Comfort padding on shoulder strap. Poly/cotton material. 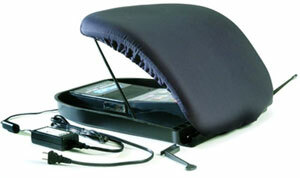 The electric lifting cushion that turns an armchair or sofa into a lift chair. It gently seats and raises users from an armchair or sofa. Provides safe, controlled support and lifts 100% of the user's weight. Lightweight (12 lbs. ), with built-in carry handle, easily transported from room to room. Stops automatically when it reaches its maximum height, or you can stop it by pushing down on the power lever. Waterproof incontinent cover is easily removed and washed. Water-resistant coating on foam surface can be wiped with a damp cloth. Cushion is made of a high density, slow-release memory foam that helps protect against pressure sores and conforms to the shape of the body. Weight capacity: 300lbs. Makes any armchair an automatic lifting seat. Self-powered lifting cushion assists you gently up and down from an armchair or sofa. As you sit down in a seat, you are gently eased into a seated position. The lifting piston activates automatically as you shift forward and begin to stand, providing a stable lift up from the chair or sofa. Portable with built-in carrying handle. 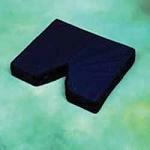 Coated memory foam cushion adjusts to the users weight, shape and temperature. Waterproof, fire retardant cover is removable and machine washable. Weight: 9 lbs. Black.